Samsung, the Korean smartphone manufacturer has officially launched a new budget phone which is called as Galaxy A20e. Unveiled in Poland, the phone is basically a tone-down version of Galaxy A20 that was recently launched in the Indian market. Visually, the phone looks very similar to Galaxy A20 featuring a plastic finish and fingerprint sensor. The smartphone also features an Infinity-V display along with dual rear camera. However, the company hasn't revealed the prices as well as the availability yet. The new Galaxy A20e comes in two colour shades - White and Black options. Samsung's New Galaxy A80 Phone Features New Infinity Full-Screen Display & 48MP Rotating Camera. 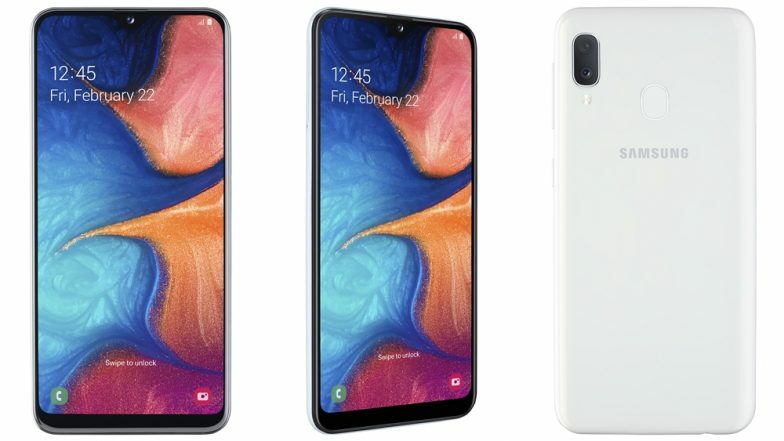 Coming to the specifications, the newly unveiled Galaxy A20e from Samsung features a 5.8-inch Infinity-V Display with HD+ resolution, which is slightly smaller than Galaxy's A20 screen (6.4-inch). Under the hood, there is an Exynos 7884 chipset which is clubbed with 3GB of RAM and 32GB of internal storage. The phone also gets provision for memory expansion through microSD card. Samsung Galaxy S10 Flagship Smartphone Easily Fooled By User's 3D Printed Fingerprint; Watch Video. For photography, there is a dual camera module at the back which includes a 16MP primary sensor with f/1.9 aperture and a 5MP secondary sensor featuring an f/2.2 lens. At the front, there is an 8MP shooter with f/2.0 aperture for selfies and video calling. Additional highlights of the smartphone include rear fingerprint sensor, 3000 mAh battery with 15W fast charging and more. You Can Trick Samsung Galaxy S10 with a 3D Printed Fingerprint. As far as the prices are concerned, the company hasn't revealed it yet. However, Galaxy A20 is priced at Rs 12,490. If the phone is introduced in the domestic market, it could be priced below Rs 12,000 bracket.